Vertical gardening systems come in tons of different variations, and can look amazing! From obelisks, pergolas and arbors, to tower gardens, wall planters, and living art, it’s time to let our creativity run wild! 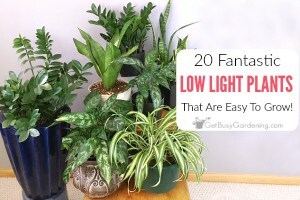 In this post, I’ll define the types of vertical gardens, show you some examples, and talk a little bit about each one. One of the things I love the most about growing vertically is that I can get so creative with it. Vertical gardening systems add structure and beauty to the garden, and give it tons of character. Plus they allow us to grow in spaces we never would be able to otherwise. 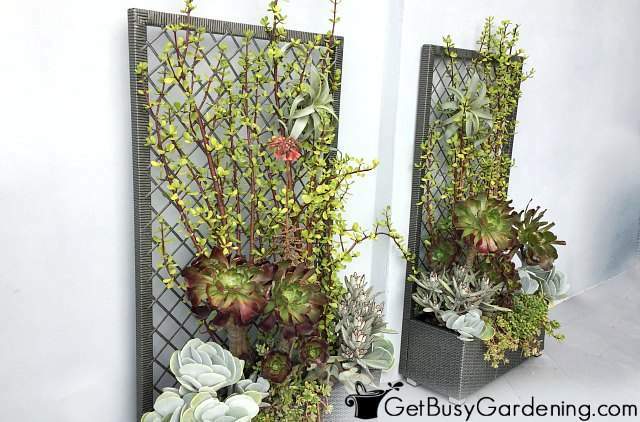 When you start considering all of the different types of vertical gardens you could create, it will really open your eyes to a whole new way of thinking. 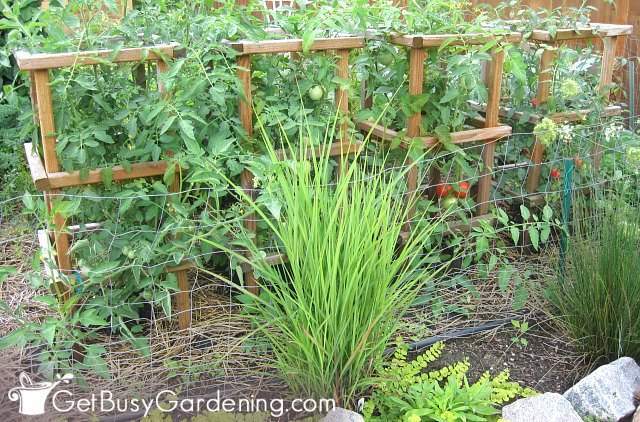 The good news is that we’re not just limited to using boring trellises or plant stakes! 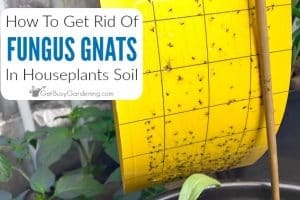 As you read through this list, think about how you can incorporate unique vertical growing systems into your garden design. What Is A Vertical Gardening System? In short, vertical gardening systems can be defined as any type of support or structure that is used to grow plants up and off the ground. They come in tons of different shapes and sizes, and can take on many forms. There are many types of structures and supports you can use for growing plants vertically, and there’s tons of room for creativity. Vertical growing systems can either be built in the ground, or by using containers. It’s not just limited to garden plots either! Vertical garden systems can also be hanging on walls, dangling from balconies, or standing on a deck or patio. 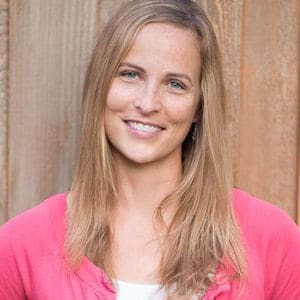 In this section, I broke down the types of vertical gardens into two lists. 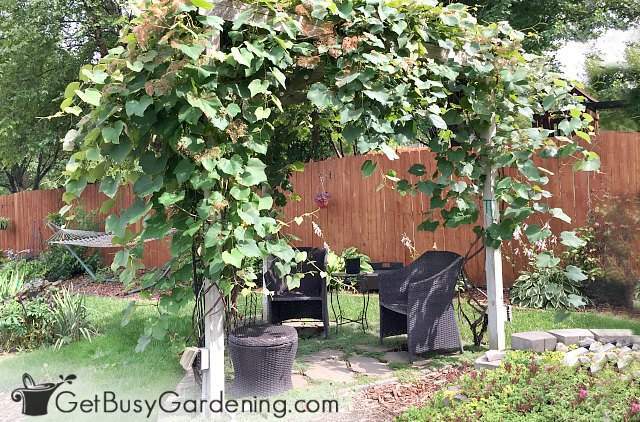 First I’ll talk about climbing plant support systems you can use for trellising vines. Then we’ll discuss vertical garden containers for growing plants anywhere. 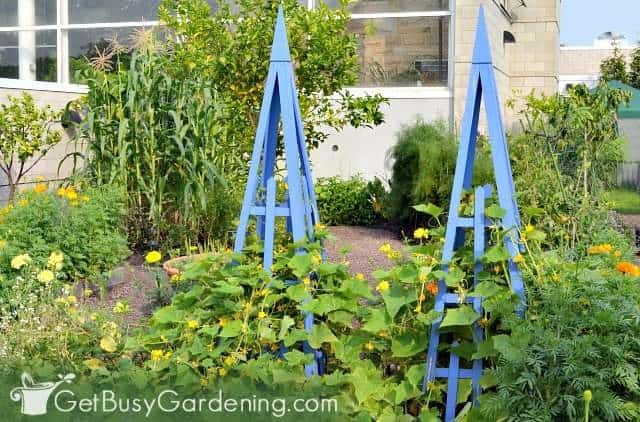 Climbing supports are vertical growing systems that are used for trellising vining plants. Most gardeners add boring stakes or structures to their garden as an afterthought, and out of pure necessity as plants grow larger. 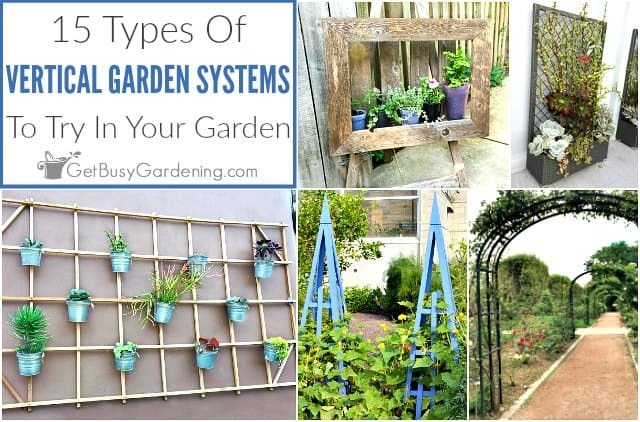 Trellis structures are probably the most well known type of plant support systems, and they come in many different shapes and sizes (from a small fan trellis to a larger structure). 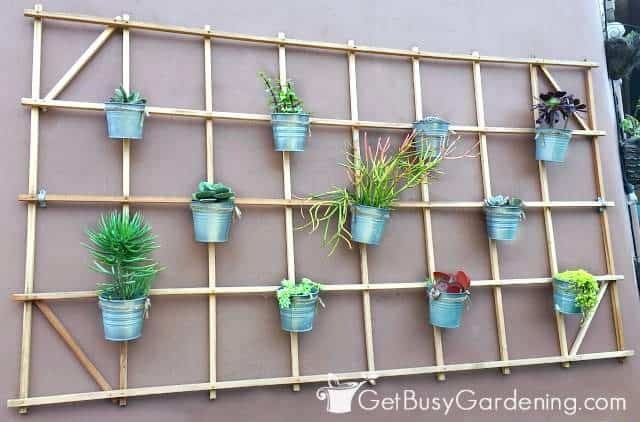 But generally speaking, a trellis is a flat structure that can either be freestanding, or it can be attached to something else, like a planter, a wall or a fence. An arbor is a structure that is frequently found at the entrance of a garden, or over the top of a pathway. They can be arched or square shaped on top, and the height and width vary depending on the design. It’s common for arbors to have latticework on the sides that is perfect for climbing plants to grab onto. Teepees are fun vertical gardening systems that are easy to make. They can be fashioned out something as simple as a few twigs collected from the yard tied together at the top with twine. Or teepees can be more permanent structures that you can make out of things like heavy-duty garden stakes, metal or wood. Larger than arbors, pergolas are permanent structures that are commonly used to shade a patio, deck or garden area. Arbors and pergolas are similar structures, and often times the only difference is their size. Large pergolas are perfect for adding privacy for a sitting area, or creating small rooms in your garden. An arch in the garden can take the form of an arbor or a pergola, or it can be an architectural element on its own. 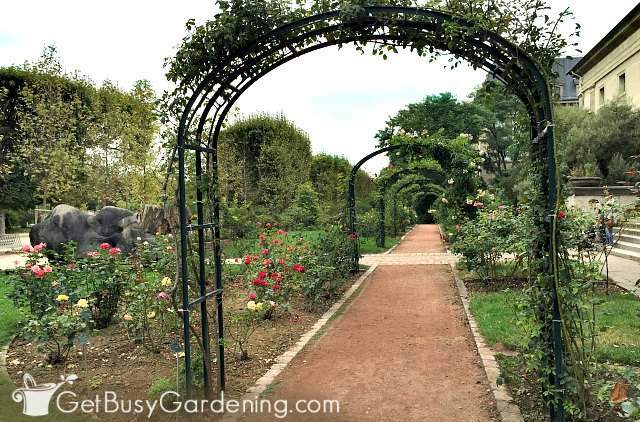 Large arches are often used to create tunnels or shaded pathways in the garden. Small arches can be used in the vegetable garden to double your growing space by training vines over the arch, and planting smaller crops underneath. Obelisks are pyramid shaped vertical growing systems that have four sides, and are traditionally found in formal gardens. These days obelisks can be round shaped or square. They can be made out of any type of material, including wood, metal or plastic. Or even fashioned out of rustic materials like twigs and grapevines. Plant cages are often circular or square, and can range in complexity from small wire tomato cages, to heavy-duty wooden cages. They could even be something as simple as a circular piece of leftover garden fencing or chicken wire tied together at the ends. A-frames and lean-tos are simple structures that can easily be made out of wood, twine or metal garden fencing. They are almost identical, but an a-frame is shaped like an inverted V, where a lean-to leans to one side. Take traditional container gardening to whole new heights by combining it with vertical gardening. When you mix these two methods together, you can come up with some fun and unusual vertical gardening systems. Whether you’re looking to dress up a boring blank wall or fence in your yard, or you want to add some bright and unique living art to your balcony, deck or patio, vertical planters are the answer! A tower garden is simply a way to describe tall or stacked container gardens. Tower gardens can be anything from a tall structure that is made out of wood, metal fencing or plastic. 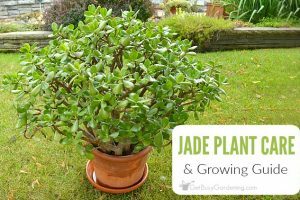 They can be as simple as a few stacked planters or pots, or you can purchase much fancier commercial vertical growing systems. Hanging gardens can be anything from a few pots or baskets suspended from a hook on a fence, balcony or deck. Or they can be something more complex like flower pots on a railing, attached to a wall, fence, or other vertical hanging structure. Living walls have become a very popular way to grow tons of different types of plants. These vertical gardening systems are especially great for those who have small growing spaces. You can start with something small like a few wall pockets, or build a larger living wall if you have the space. Heck, you could even build a living wall indoors! Living picture frames are another huge trend these days, and one of my favorites! Picture frames are no longer just for displaying photos of our loved ones or favorite works of art. 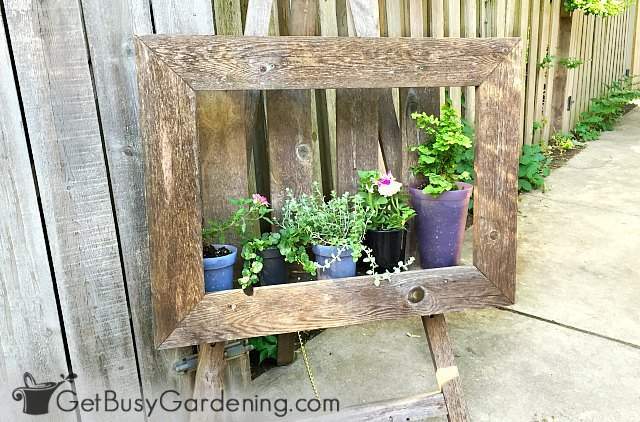 You can plant small picture frames for hanging on a wall or fence, or create larger living pieces of art to display on an easel in your garden. A freestanding vertical garden is a self-contained growing system that is not planted in the ground. These growing systems make clever use of pots and planters to create vertical gardens that don’t require any garden space at all. Freestanding gardens are perfect for growing in places like a deck, patio or even on a roof top! Vertical gardening systems are wonderful for adding flair to your growing space, and there are so many fun options! 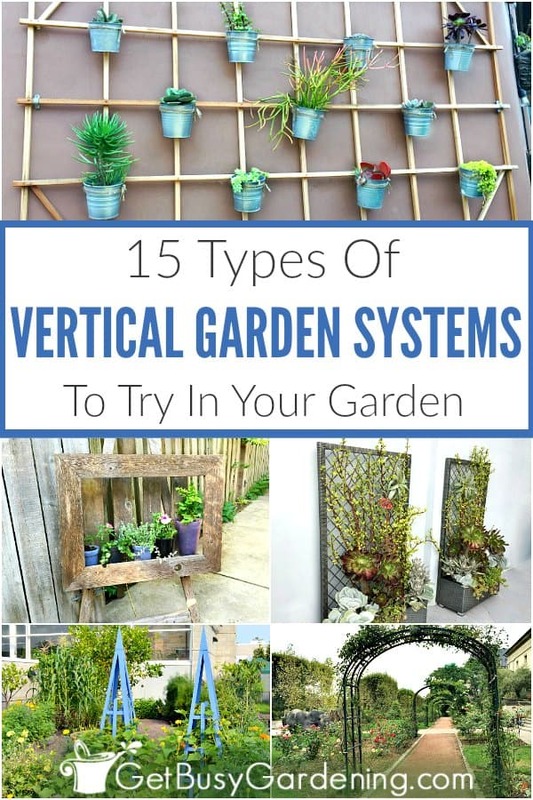 So be sure to take some time to think about which vertical growing systems you could use to make your garden look amazing. 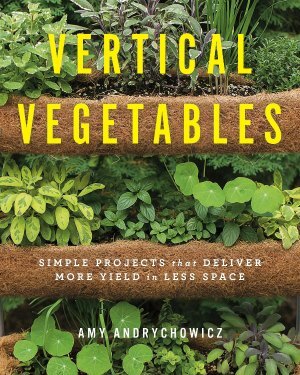 If you’re excited and want to learn more about how to grow your own food vertically, then my brand new book Vertical Vegetables is just what you need! 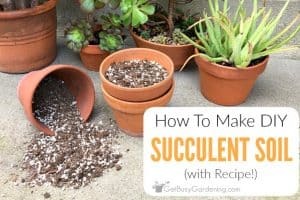 In it, you will learn everything you need to know about growing your favorite food vertically. Plus, I show you exactly how to build almost two dozen step-by-step DIY vertical garden systems! Tell us about your favorite vertical gardening systems, or types of vertical gardens you’ve created in the comments below.